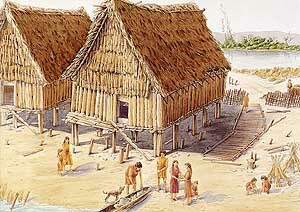 Musee National Suisse - Balade en préhistoire - scène d'échanges dans un village néolithique, vers 2.700 avant J.-C. - Aquarelle de Brigitte Gubler. Photo: Antiquity Publications Ltd, published in New Scientist, 3rd September 2005. 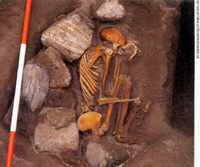 Bronze Age Britons practised the art of mummification at the same time as the Egyptians. And it appears that the ancient Britons invented the skill for themselves. Archaeologists unearthed the skeletons of a man, a woman, and a 3-year-old girl under the floor of a prehistoric house at Cladh Hallan on the Scottish island of South Uist. Although no mummified body tissue remained, other evidence was found. 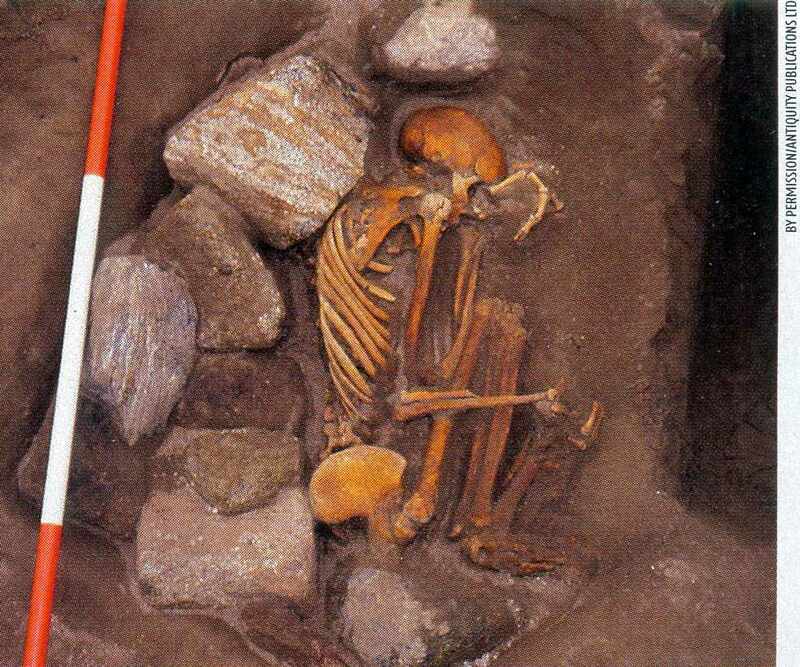 The adults'corpses were locked with their knees close to their chests, similar to Peruvian "mummy bundles". "The bodies must have been trussed up that way because you can't bend a body like that normally," says Jeri Hiller, a. biophysicist at the University of Cardiff, UK, who examined the skeletons. Hiller thinks that the bodies were immersed in an acid peat bog for a few months - long enough to remove some of the soft tissue but keep the tendons and ligaments intact. The acid would also slowly demineralise the bones, an effect that could be tested. Hiller's analysis showed a breakdown of minerals in the outer 3 millimetres of the bones (Antiquity vol 79, p 529). This is the only example of mummification in Europe, she says,"It's nothing like the techniques used in Egypt. People used the natural resources, available to them to carry out this incredibly sophisticated process."